With our constant efforts, we can provide customers with various customized promotional key chains, the PU keychain is a kind of our customized keychain products. 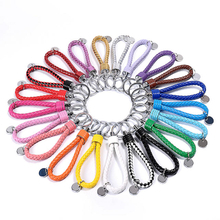 The PU keychain mainly includes leather strap weave rope key rings, they are colorful, and we guarantee you will find your favorite color. Except the leather strap weave rope and ring, we also design a small round metal sheet to add its aesthetic degree. The custom PU keychain is made of high quality PU material, and it is completely tested. Our leather strap weave rope key rings are through 3D design, it is delicate and durable. Key ring is also anti-rust, no fade and rust. The personalized PU key ring can protect your original flip key from scratch and damage. Beautiful appearance will perfect match your key series. If you are in love with custom PU keychain, you can choose our leather strap weave rope key rings and they won’t let you down.